*using a mortar, pound the coriander root, black pepper and garlic until finely blended. *then mix with minced pork and soy sauce in a mixing bowl. 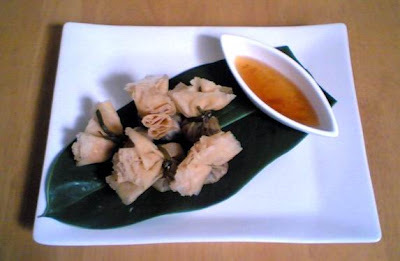 *place a wanton wrapper on your palm and put a teaspoon of pork in the centre. *wrap the minced pork and then tie it tightly with the spring onion. *if the wanton does not seal well, use egg yolk to help seal the wrapper. *deep fry in hot oil for 3-5 minutes until golden. *drain on paper to absorb the excess fat. hello from australia! how are you? great photos - looks really yummy! I am going to bangkok in november and would really like to try these! I have also been to mango tree last time i was in bangkok and really loved it, and was in search of something just as good! Could you please translate these into thai for me, so i can give it to the taxi driver? thanks very much!